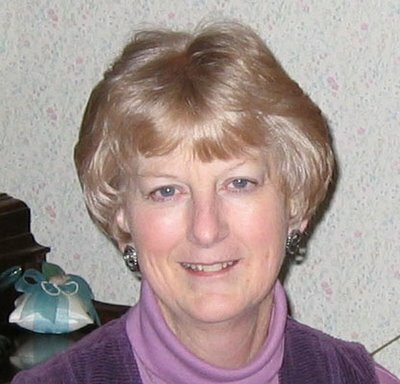 Last week, I was home for a quick visit--just two short days, punctuated by a visit to the funeral home and some maintenance on the car. Visitation was for a family friend who succumbed to ALS, and whose husband carpooled with my father to work for many years. Ron would come in almost every Friday after work to enjoy a beer at our house, and sometimes he would light up his pipe while he sat and spun yarns. I love the sweet tobacco smell of pipe smoke, and it reminds me of Ron every time I smell it. 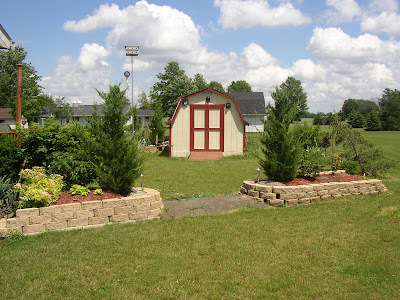 One year for Mothers' Day, I helped my Mom plan a little garden in the leftover square where the back patio, Dad's new shed, and the garage all met. I always think of this as "Sally's Garden," because the yellow rose at its center was planted in memory of my aunt Sally who died of breast cancer. Al and Sally had bought her parents' old house when their kids were still pretty young, and they faithfully tended her father's (Clarence's) roses there. 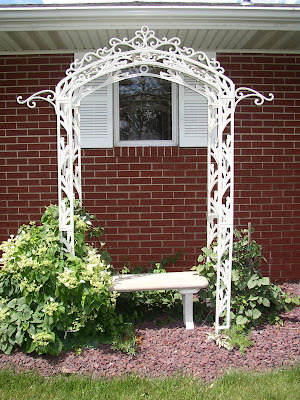 This gorgeous white-painted metal arbor is beautiful already. 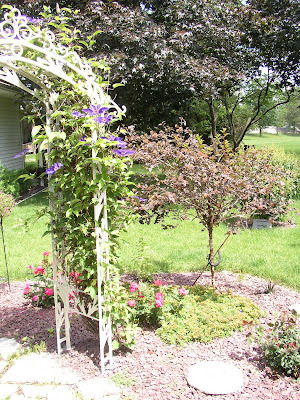 Can you imagine what it's going to look like when those climbing hydrangeas scramble to its top? Time to leave Renee's pretty yard and move down the road a little bit. A short walk from my parents' house, just across the highway, is where my Aunt Becky (my godmother) and Uncle Don live. They met at the hospital where Becky was a nurse, and Don often delivered flowers for his job at, as he calls it, "the flower shop." The rest is history, and we ended up adding a wonderful uncle and 3 very fun cousins into the family. And as far as I know, Don still brings Becky home a single flower every Friday, as he has every week since they've been dating. Isn't that sweet? Maybe I shouldn't say it's finished quite yet, though, as Don seems pretty adamant about wanting to put a wooden footbridge across that strip in the middle. Becky is digging her heels in a bit on this one for some reason, but I think it would be a fun idea. So let's keep our fingers crossed that Don wins this round, shell we? The bench is supposed to be on the ground in front of the bed, but they had just mowed recently and left it up. I didn't notice it before I snapped the shot. 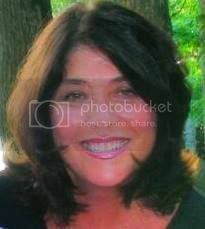 (That's what happens when you sneak over to someone's house to take pictures without them being home!) The evergreens in this picture are going to be topped off at about the height of the tallest one now, which should make them thicken up a bit and offer additional privacy. Very fun. They started out with a small pond at first, but a couple of years ago they widened and deepened the pond, redid the rock edging, etc. The lighthouse at the top of the mound behind the pond lights up at night, and water cascades down the stone steps constantly. And they have lotus that bloom, too! If you look closely at the front of the pond, you'll see some randomly strung line crisscrossing the water. This keeps the herons out, and Don is happy to report that it seems to work as well as netting does, while being much less obvious. This spring they have had some trouble getting the water clear in the pond, but it's starting to look much cleaner now and I had a very clear view of all of the fish. I decided I like the shubunkins best. The third big project of 2007 can be seen in the picture above. They created a little deck that meets the edge of the pond. When you walk out the sliding glass door onto the deck, you feel like the front of the deck must be anchored in the pond--it's that close! I was tempted to stick my feet in, but I didn't think that the fishes would like that. Actually, they would probably have nibbled at my toes, as they flock to the deck whenever they hear footsteps on it. Someone might be tossing out fish food, you know! The other thing I love about Becky & Don's garden is that they always have some beautiful, unique plants there. 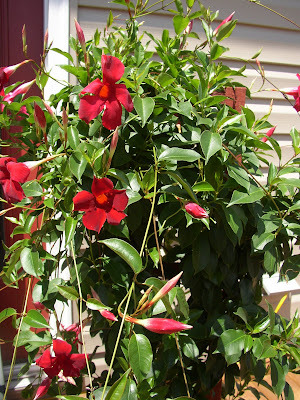 This Brazilian jasmine/mandevilla vine was so full and lush in its pot that I had to touch it to make sure it was real. Their garden was the first place I saw both the annual Mexican heather, and tricolor sweet potato vine, several years ago. And this time, I got to go home with my own treasure. 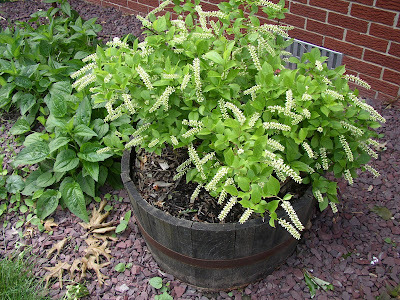 Years ago, they took home some tropical smokebush plants, euphorbia cotinifolia, that were going to be thrown out. They need to be overwintered inside, but they're so pretty--their leaves look like the regular purple smokebush leaves, only in miniature! Since a few other plants are starting to get larger and they were worried about having room to overwinter everything this year, they offered me one of their two pots of tropical smokebush... and I was more than happy to take it off of their hands, as you can imagine. But pictures of that will have to wait, as it's dark outside and I am sleepy. Hope you enjoyed the mini-tour of some of my favorite gardens "back home!" Oh, that Physocarpus as small tree has my mind churning with ideas... I've never seen that before either. You'll have to find out how long it took to do that. Too bad it apparently needs staking with rebar, but maybe if something grew up underneath it you wouldn't see the stake. So sorry to hear about your friend Kim. This was a delightful tour of the old neighborhood. Thanks for taking us along. 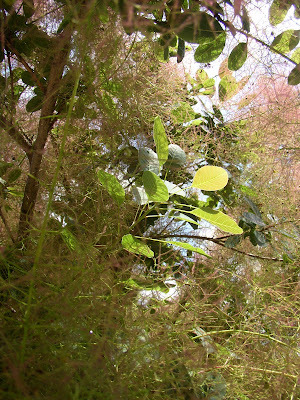 I have never seen a tropical smokebush so I will look forward to your pictures. Great tour! I like to prune a lot of bushes as standards also, I think they just look better. I've got a lilac with three stems that I'm braiding, and so far, so good. Hey, bend em' to your will, I say! 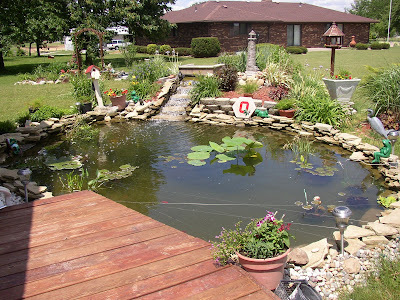 :) LOVE that pond, BTW, and good advice on the heron blocker. I'll have to try that with my tubs, cuz' I put fish in it this year, and they were gone by the next day! (Only feeder goldfish, luckily.) Travel safe! How fun! I wonder if Renee felt as my mom and I did - that Beining's looked better than ever this year. Lots of new things and lots of them. I was there again recently (when I purchased the 'French Lace' Weigela) and they'd sold a LOT since my first visit earlier in the spring. 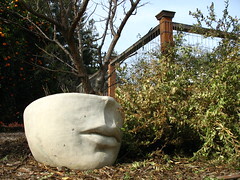 I love visiting other people's gardens, whether in person or virtually. Thanks for taking us on this tour! By the way, I was in Ottawa a few weeks ago! (Geocaching) We started in Lord's Park and did some other ones there in town. We talked to a lady that lives next to one of the parks (where the Boy Scouts meet), and she had coordinated pet rescue during the flood last year. She knew who your brother was, when I mentioned the wedding and him being in the news. Greenbow Lisa, thank you. The tropical smokebush is really cute, but I want to get it into a home before I show off pictures! lisa, I think that cats and raccoons have been known to raid fishponds, too. 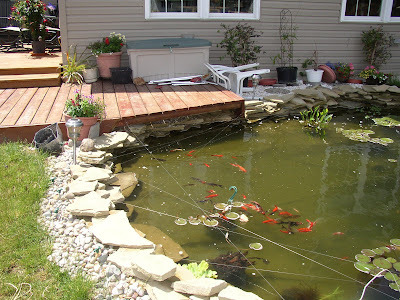 Becky & Don's is big enough that the fish escape to the deeps to get away from them... but you might have to be a little more ingenious in a smaller pond/pot! How funny that you met someone who knew my brother, at least through the story. My aunt Sally (of the rose bed mentioned in this story) and uncle Al used to live near Lord's Park, which I always think of as the Waterworks Park. (That's what it was called when I was a kid.) And my DSIL (of the overachievers/new veggie garden fame) grew up on one of those side streets, too. Her Mom still lives there, as do her brother and his family since they are still trying to get their house rebuilt after the floods. Kim, what a lovely trip through your family's gardens. It's obvious that the green thumb runs in your family! Isn't it fun to guerilla photograph? And I liked that this was a nice long post, I kept hoping it wouldn't end so I could see some more! What a great pond! So..does that have to be drained each winter? What happens to the fish? I enjoyed the tour very much, thanks Kim! That mandevilla is really something, isn't it? 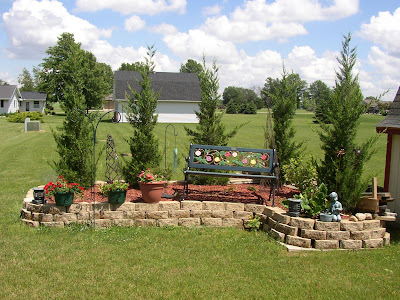 Becky and Don have done a wonderful job with their yard, and Renee's garden is lovely too. Sally's Garden is so pretty with that lovely combination. What lovely memories it must hold for you. And lucky you to go home with a smokebush! Another delightful post, Kim, and most touching. I do believe that you are an 'old soul'. The more you share, the more I see how special you are. 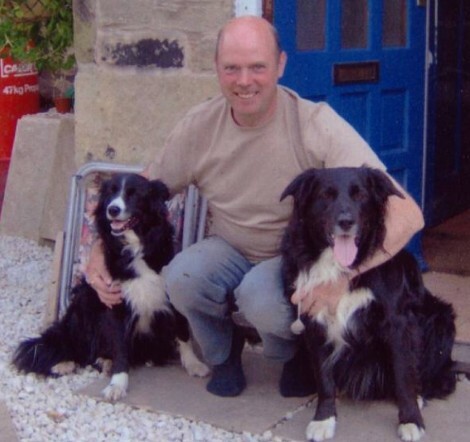 I'm sure all will be thrilled to see their gardens highlighted in your beautiful blog. There's no place like home ... memories are treasures that you have a gift for uncovering. Hi Kim, thanks for my birthday wishes. I like pictures of the gardens, that Arbour is really nice, I assume the bits that stick out at the top are for hanging baskets if you wanted to hang them. Bob. 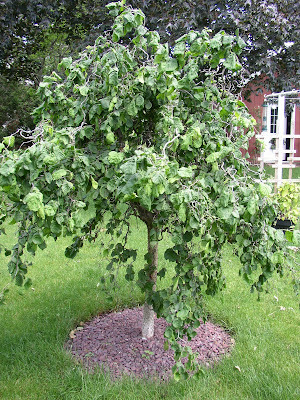 I love the idea of the Contorted Hazel as a tree form. Lots of neat things in all the gardens. Who says you can't go back home again? Thank you for the tours of some lovely gardens. That pond is awesome. So sorry about your friend. I get together with a group of friends from my old job, and just learned at our dinner last week that one of the guys was diagnosed with ALS a few months ago. Such an awful disease. That ninebark is pretty cool. However, I don't think I'd have the patience, or guts, to do that. Maybe some day. How does one do that anyway? Carefully. Holy croly pond! I just wanted to say that is nice to take a break in my travels to read your blog. 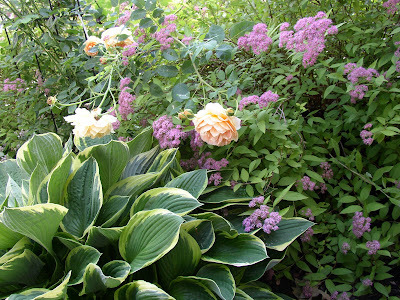 See you in August for more inspired plantings.